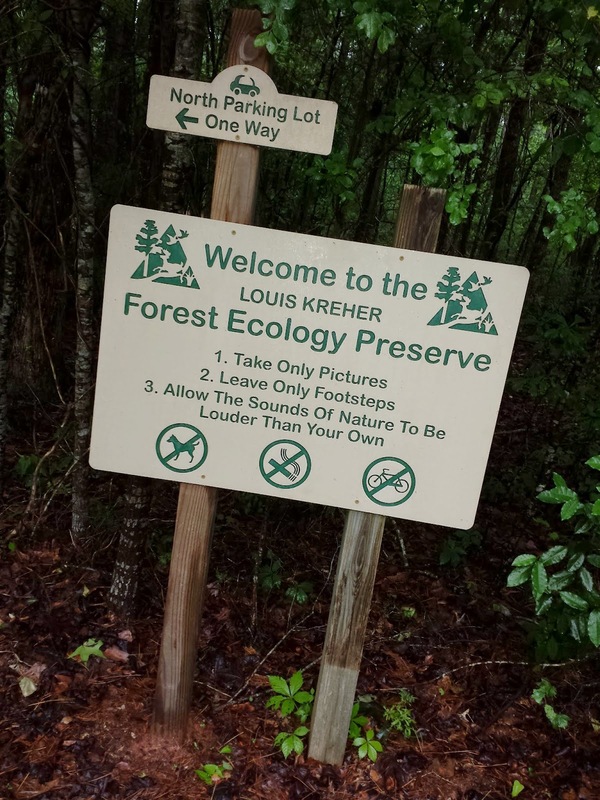 Troop 50 camped this past weekend at the Louise Kreher Forest Ecology Preserve as part of its annual planning retreat (first conducted in May 2013). However, with rains on and off Friday and Saturday, the troop experienced bouts of retreating to dry ground throughout the three-day campout. Fortunately, rain dampened neither the opportunity to plan for the 2014-15 troop year nor our helping the newer Scouts continue their advancement efforts toward the rank of Tenderfoot. The troop camped at a site by the pond, off the Preserve's North Parking Lot, coming full circle since the troop's inaugural campout there in January 2013. Planning retreat activities began Saturday morning as parents arrived and the troop assembled at the Preserve's amphitheater. After Troop Committee Chair Rob Stanford welcomed everyone, the group of more than 30 Scouts and leaders quickly went to work in two groups. In one group, in a discussion led by Senior Patrol Leader Will, Scouts shared ideas for activities, programs, merit badges and other advancement opportunities. Later, they discussed meeting and campsite etiquette, leadership and any other topics they felt should be examined. Other leaders and parents, in discussions facilitated by Rob Stanford, identified ideal times each month for campouts and day outings, reviewed opportunities for adult leadership and specific needs the troop had, reviewed the troop's finances, and established the budget for the coming year. The adult attendees then traveled to the campsite where, after enjoying a hamburger lunch prepared by the Scouts; leaders, Scouts, and parents together tentatively plotted on the troop calendar the ideas Scouts had for campouts and outings. 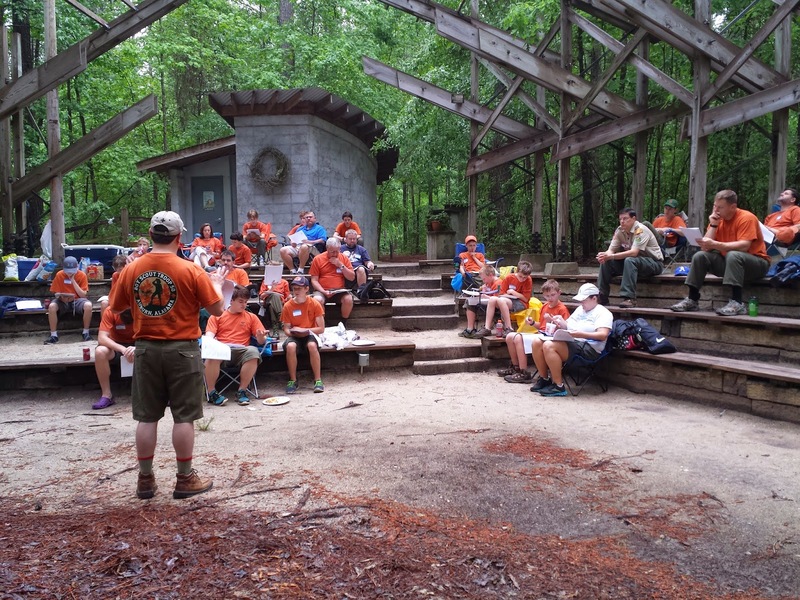 Adults continued their discussions of finances, membership, and other topics while Scouts broke into patrols to participate in an orienteering and geocaching activity as follow up to its recent troop meeting focus on geocaching. Rain that cropped up Saturday afternoon quickly cleared and gave way to the first sign of sun and blue skies seen since arriving at camp. 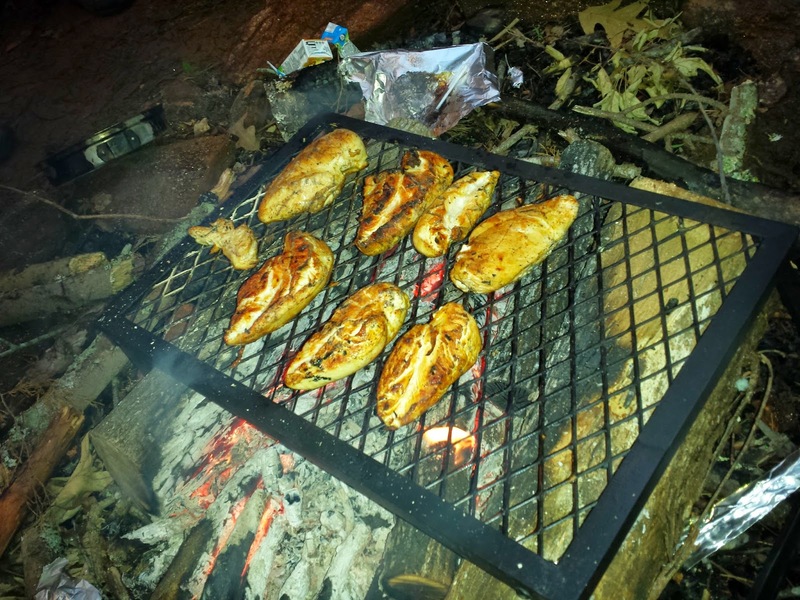 After a dinner that included grilled chicken prepared by the Scouts, the troop gathered for a campfire emceed by Michael and featuring a variety of planned and impromptu skits and songs offered by Scouts and leaders. At the end, everyone enjoyed cobbler prepared by Scoutmaster Baird. 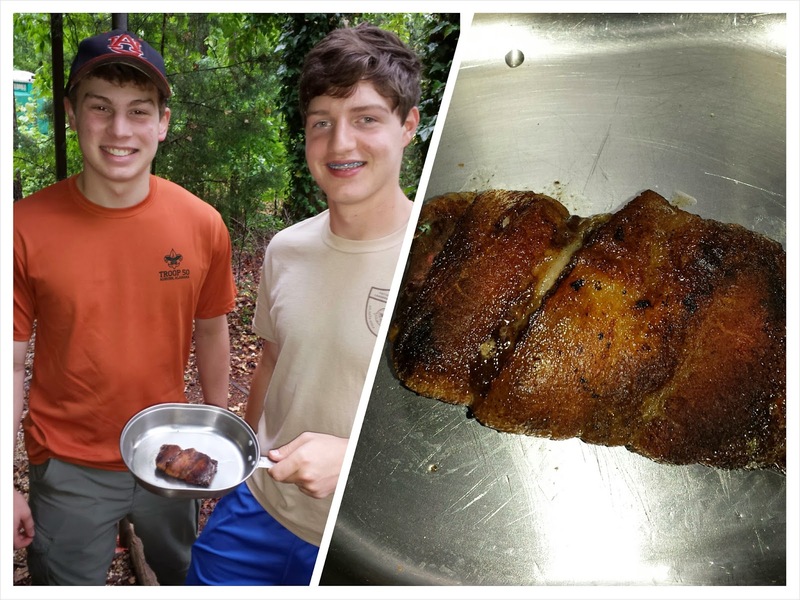 Hamburgers, grilled chicken, and cobbler weren't the only delicacies Scouts had a hand in preparing during the weekend. Reprising their efforts to bring new, bacon-themed culinary delights to the troop's dining palette, first attempted with the bacon-wrapped Little Debbie Zebra Cake during the Saugahatchee District 2013 Spring Camporee, Scouts Davis and Kyle offered a new creation - the bacon-wrapped Little Debbie Cosmic Brownie, which they said "was good." However, like the bacon-wrapped Zebra Cake, which has not seen the light of day or the inside of a skillet again, we're not sure we'll see bacon-wrapped Cosmic Brownies on the menu in the future! The troop woke early on Sunday, packed up camp and, in observance of Scouts' "duty to God," held a devotional service before leaving camp to wish their mothers a happy Mother's Day. While a few troop meetings remain before the troop concludes its academic year meeting schedule with its June 2 court of honor, the campout concludes the troop's 2013-14 weekend campout schedule. Summer activities will include an older-Scout contingent heading to Camp Daniel Boone in Canton, N.C. in June for its "Five Rivers in Five Days" whitewater rafting program, and the majority of the troop heading to Camp Woodruff in Blairsville, Ga. in July for a week of traditional summer camp. The troop will gather for tentative day outings during the summer, as discussed during the planning retreat, before resuming its regular troop meeting and camping program in mid-August. View more photos from the weekend on the troop's online photo album.